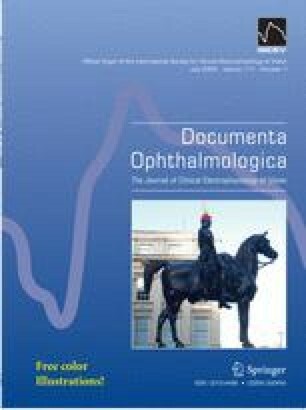 Purpose: Investigate the function of the central retina in subjects with a history of retinopathy of prematurity (ROP). Methods: Multifocal electroretinogram (mfERG) responses to a scaled array of 103 hexagons were recorded in subjects, aged 11–23 years (N = 11), with a documented history of mild ROP. The amplitude and implicit time of the components (N1, P1, N2) of the first order kernel for six concentric rings were compared to those of control subjects (N = 9). Results: The amplitude of each component varied significantly with eccentricity in both ROP and control subjects and was significantly smaller in the ROP subjects. The discrepancy between ROP and control subjects was greatest for central rings (1–3) and smaller for peripheral rings (4–6). The slopes of the functions summarizing log response density as a function of log eccentricity (degrees visual angle) were significantly shallower in ROP subjects. The implicit time of each component was longer in ROP subjects at all eccentricities. Conclusions: ROP associated alterations in neural retinal development may underlie the subtle macular dysfunction disclosed by the mfERG.